Neil J. Zemmel, MD, FACS of Richmond Aesthetic Surgery conducts a comprehensive consultation for breast augmentation patients to ensure the ideal implant size is selected. Richmond, VA – Neil J. Zemmel, MD, FACS, a plastic surgeon in Richmond, finds the size of breast implants to be one of the most common concerns among his breast augmentation patients. To address this, he provides a thorough consultation process, where he can better understand the patient’s goals and recommend an appropriate range of breast implant sizes. 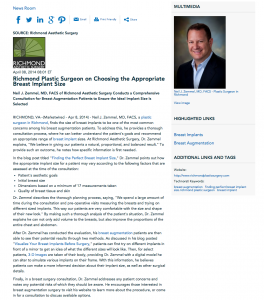 At Richmond Aesthetic Surgery, Dr. Zemmel explains, “We believe in giving our patients a natural, proportional, and balanced result.” To provide such an outcome, he notes how specific information is first needed. Dr. Zemmel describes the thorough planning process, saying, “We spend a large amount of time during the consultation and pre-operative visits measuring the breasts and trying on different sized implants. This way our patients are very comfortable with the size and shape of their new look.” By making such a thorough analysis of the patient’s situation, Dr. Zemmel explains he can not only add volume to the breasts, but also improve the proportions of the entire chest and abdomen. After Dr. Zemmel has conducted the evaluation, his breast augmentation patients are then able to see their potential results through two methods. As discussed in his blog posted “Visualize Your Breast Implants Before Surgery,” patients can first try on different implants in front of a mirror to get an idea of what the different sizes will look like. Then, for select patients, 3-D images are taken of their body, providing Dr. Zemmel with a digital model he can alter to simulate various implants on their frame. With this information, he believes patients can make a more informed decision about their implant size, as well as other surgical details. Finally, in a breast surgery consultation, Dr. Zemmel addresses any patient concerns and notes any potential risks of which they should be aware. He encourages those interested in breast augmentation surgery to visit his website to learn more about the procedure, or come in for a consultation to discuss available options. Board-certified plastic surgeon Neil J. Zemmel, MD, FACS is the founder of Richmond Aesthetic Surgery. He earned his Bachelor of Science from the College of William and Mary and his medical degree from the University of Virginia School of Medicine. Dr. Zemmel then completed an internship and later a general surgery residency at the Medical College of Virginia, Department of Surgery in Richmond, Virginia. He continued his medical training in a plastic and reconstructive surgery residency at Virginia Commonwealth University Medical Center, where he was Chief Resident his last year. Dr. Zemmel is a Diplomate of the American Board of Plastic Surgery and is a member of such prestigious organizations as the American Society of Plastic Surgeons, the American Society for Aesthetic Plastic Surgery, and the Medical Society of Virginia. He is available for interview upon request. For more information about Dr. Zemmel and his Richmond plastic surgery practice, visit richmondplasticsurgery.com, vabreastsurgery.com, and plus.google.com/109479035144616950506/about.